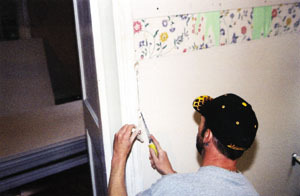 When faced with old, damaged plaster walls, one technique to dress up the room is to install drywall over the existing plaster. A drywall overlay gives the walls a smooth, fresh surface that’s ready for new paint, paper or trim. 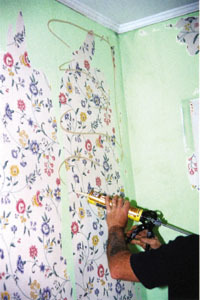 This is a common technique used among professional contractors hired to renovate houses bought under foreclosure. For example, real estate companies that invest in foreclosures often deal with houses that are more than 50 years old and exhibit serious signs of aging. The high cost of installing new plaster, or demolishing the existing walls, drives many such companies to hire contractors to overlay drywall as a practical, economical and attractive means to update the home. 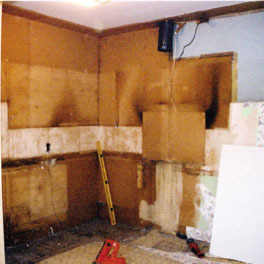 Before jumping into the project, be aware of a couple of side effects of a drywall overlay. The thickness of the drywall material will make the walls encroach into the room. This means the edges of woodwork such as crown molding, door jambs and other trim can appear “swallowed” by the walls if left in place during the installation. As a speedy cost-cutting measure, real state companies sometimes specify that the trim be left as is, but most homeowners will probably want to remove the jambs and install extension jambs to keep the intended look of the woodwork. Keep in mind, though, that extending door casings too much can sometimes interfere with the door swing. To avoid the “swallowed” look on crown molding, you can first remove it and then install new molding over the drywall. However, removing the molding from old plaster can sometimes cause the plaster to pull out in large chunks, giving you a new repair project. If you can leave the molding in place, and install the overlay so the transition where the sheet meets the molding still looks good, then that might be your best bet. Always remove the baseboard prior to installing the drywall. Also, electrical outlets and switches may need to be updated to code, usually with extension rings. Check the National Electric Code for the latest specifications. 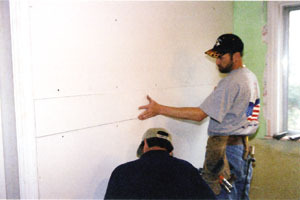 The basics of hanging drywall don’t require a great deal of technical skill, but accomplishing a professional-looking finished job does require a little finesse. First, gather all your necessary tools and materials at the jobsite. Gypsum-board drywall is generally available in 4-by-8- and 4-by-12-foot sheets. 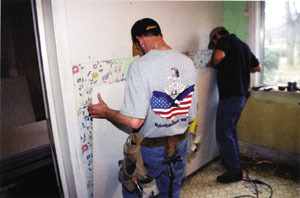 Thickness ranges from 3/8, 1/2 and 5/8 inch, but 1/2-inch sheets are recommended for wall coverings. Joint compound is available in 1- or 5-gallon buckets. The 5-gallon option is the most economical. It’s also a good idea to recruit some assistance to hang the drywall. The sheets can be large and awkward to handle, and having a partner will speed up the project and make the job much easier. 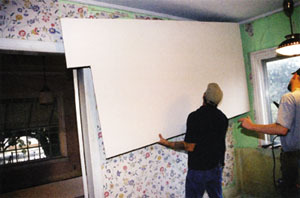 Drywall sheets should be installed horizontally, starting at the top of the wall. 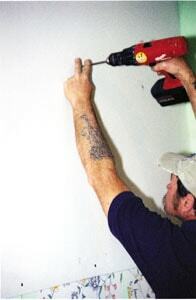 Mark the locations of the studs on the existing plaster walls to help you locate them later. Use a caulk gun to apply a liberal amount of Liquid Nails to the old wall surface. Raise the sheet and position it flush into the upper corner of the wall, covering the Liquid Nails. Once in place, fasten the sheet into the studs with drywall screws spaced about 18 inches apart. Be sure to countersink all the screws. After the Liquid Nails has set up, the drywall will be firmly attached to the plaster. Hang the sheet horizontally, starting from the top. Next, install the sheet at the bottom of the wall in the same manner. Leave a 1/2-inch gap between the sheet and floor to compensate for any unevenness in the flooring. The gap will be concealed by the baseboard. Hang the bottom sheet and cut it to fit. Installing the top and then bottom section of the wall usually leaves a space between the upper and lower sheets. Cut a panel of drywall to fit into this joint, butting the edges together with the other sheets. 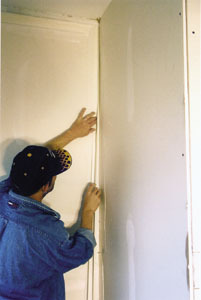 The advantage of locating the joint in the middle of the wall is that you have room to feather the compound upward and downward from the joint to blend it smoothly into the surface. Install the center drywall joint piece. For panels that will cover obstructions such as outlets, switches or vents, measure and use a rotary saw to cut the locations in the sheet before hanging it on the wall. There are a number of great tools that make cutting drywall a snap, from jigsaws to specialized hand saws and more. 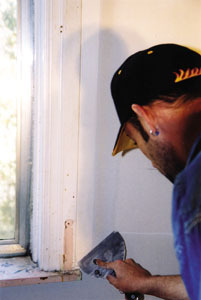 You’ll inevitably have to trim the sheets to fit into corners and around doors and windows. When cutting drywall with a knife, measure and mark the cut. For long cuts, snap a chalk line. Then use a straight edge to guide the cut as you score the face of the sheet. Make another pass with the knife to deepen the cut. Bend the board backward to snap its core, and then turn the panel over to cut through the paper backing. Once cut, use a drywall rasp to plane the edges of the panel to remove any burrs or debris. When positioning the panel on the wall, use a knife to trim down any corners or seams that are too tight to allow a proper fit. Any gaps can later be filled with joint compound. Completing the drywall requires taping all edges and seams, and filling all joints, screw holes and edges with joint compound. While the procedure can appear simple, a professional finish can take some time to master. First tape the flat seams between the wall panels. Jeff Davis, contractor and owner of Straight Line Design, recommends using fiberglass mesh tape on flat seams. Mesh tape works best for flat seams. “The mesh tape is strong, and it’s also adhesive, so it stays in place. With the mesh, you don’t need an undercoat of compound,” says Davis. “It sticks directly to the sheetrock and you just mud on top of it. “The mesh tape doesn’t bend, though. So I use paper tape against casings and jambs,” he adds. 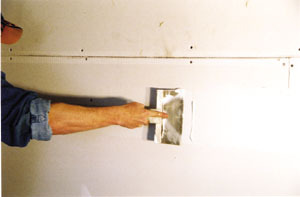 Davis uses an 8-inch knife to apply mud over the seams with mesh tape, but uses a 6-inch knife for the paper tape. 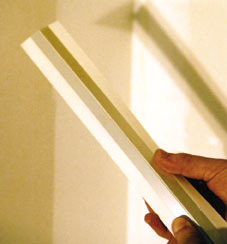 Use flat paper tape against casings or jambs. For flat, mesh-taped seams, fill the joints with compound, but don’t overdo it. Apply a thin coat, allowing it to dry completely before applying the second coat. Lightly sand between each coat. For paper tape, cut tape strips long enough to completely extend beyond the edges of the seams. A belt-mounted tape dispenser is a handy device for this job. To apply the tape, hold the putty knife at a shallow angle and apply a strip of compound thick enough to allow the tape to stick to the drywall. Press the tape onto the undercoat, and then completely cover the tape with another thin coat. Hold the knife at a sharper angle to scrape over the tape, forcing out excess mud from beneath and smoothing the seam. But be sure not to create air bubbles beneath the tape. The compound acts as adhesive for the paper tape, so shoot for a thin undercoat of about 1/16 inch. Scrape away excess mud from beneath paper tape. Joint compound shrinks when it dries, so you’ll need to apply at least three coats before painting. Lightly sand the surface after each coat has completely dried. For screw holes, apply a dab of compound to cover the holes, and then use the straight edge of the knife to scrape away any excess. 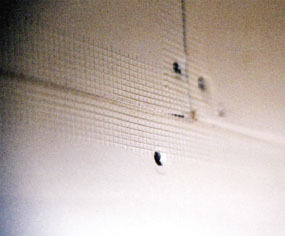 For inside corners, Davis recommends using a special corner bead tape. This tape is manufactured with two lightweight metal strips that run the length of the tape. These strips add stability to the drywall and provide a straight, uniform angle. Cut a strip of corner bead tape to length. Fold the tape down the middle, between the strips, to wrap the corner. Folding the tape also stiffens it into a rigid piece. 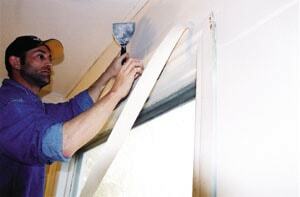 Apply a thin undercoat of compound, as with the paper tape, and press the corner bead into the corner of the drywall. The tape should be installed with the metal strips facing toward the drywall. Next, run the knife over both sides of the corner bead to squeeze out excess compound from beneath the tape (but not too much). Apply a thin topcoat to one side of the corner bead, completely covering the tape on that side of the corner. Only mud one side of the corner-bead tape per day. On outside corners, use a rigid metal corner bead for additional strength along the protruding corner seam, covering it with compound just like the inside corners. When mudding any seam, apply thin coats and feather the compound outward. It’s crucial to make sure each coat is dry before beginning a new one. Drying time depends on air-moisture conditions, thickness of the coat and other factors. Heating the room will quicken the drying time. After the first coat dries, scrape away any dried chips or smudges and sand the surface smooth. It may help to thin the second coat of compound with a little water before applying. Each coat should be thinner than the last. Adding water to the mixing bucket also helps to smooth out any lumps in the compound. Don’t worry about achieving smooth, flat perfection with the first coats. Gradually add successive coats, feathering the compound. Any visible ridge can be sanded down later. Ideally, you want a finished thickness of compound about 1/8-inch thick over any given seam. With the successive coats, use broader putty knives for a smoother finish. Before painting or papering the new drywall, sand the final coat smooth. 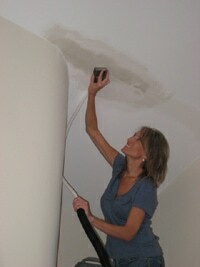 A moist sponge will also help remove drywall dust from the surface. A coat of primer-sealer is required to seal new drywall and compound. This also helps blend the joint compound into the drywall for a painted surface that appears fluid and uniform. Once the project is completed, you’ll have a new, smooth surface ready to decorate in any way you choose. You may even enjoy some improvement in soundproofing due to the increased wall mass, and all for a fraction of what it would cost to replace the old plaster. Editor’s Note: Thanks to Jeff Davis of Straight Line Design (205-966-4813) and William Moulton of Better Built Construction for help with this story. Planning to update your ceiling? Make sure to install ceiling drywall first, before installing the walls. Storage matters. 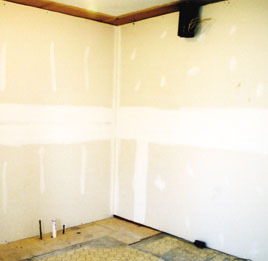 Store drywall panels flat on the floor to prevent bending or breaking. And keep the lid tightly closed on the bucket of compound to prevent it from drying out. Practice with your putty knife. And always stick with flexible metal knives, rather than cheaper plastic alternatives. When pulling the knife horizontally, exert more pressure on the bottom of the knife to achieve a thinner coat of compound at the bottom of the bed, and a thicker coat at the top. Try the opposite at the top of the seam to help feather the joint smooth.